For more FAQs, click here! Q: A dig site is currently bugged for me! A node is out of reach of the ‘dig site’ and my survey tool won’t budge, how do I fix this? A: Go clear a different dig zone then return to the problematic one, it should reset the survey. Q: How do I skill up past 100? A: After 100, you need to Solve researches to skillup. After solving something you will gain between 1-7 skill ups. Q: What can I skill up on past 100? Still adding stuff and grabbing more skill from beta! Still much work to do before Cataclysm which is predicted for a Nov. 2nd release (not official). Archaeology is a secondary profession that will be released in the upcoming expansion, World of Warcraft: Cataclysm. You will only find sites in zones of your level or lower. A level 25 player will have all 4 sites per continent in level 25 zones. (This means Outland and Northrend will have no sites at this time.) A level 80 player will have all 4 sites in any zone. A low level Kalimdor player might have sites in Ashenvale and Stonetalon, while a level 82 might have Uldum, Ashenvale, Stonetalon and Silithus. Sites are race specific. You can usually guess the race by the location. Kalimdor tends to have a lot of night elf ruins. Eastern Kingdoms tends to have a lot of dwarf ruins. Some races are only available on some continents (such as orc and draenei on Outland). You need to have a minimum character level and a minimum archaeology level to use these. Currently you can see them if you are a certain character level but can’t gather from them until your archaeology skill is higher. For Outland, the skill is 300. While somewhat consistent with other gathering skills, we think this is confusing and we will change it so that you don’t even see the digsites until your archaeology skill is sufficiently high. Tol’vir artifacts are the most rewarding, but also require near max archaeology skill to recover. Some players are reporting some issues with digsites not showing up correctly. We’ll look into these bugs. Unlike other gathering skills, digsites are player-specific. Other players will be searching in different locations. There is no competition for digsites. Each digsite can be searched 3 times before it despawns and a new site spawns. If there is a digsite somewhere too far away from you or otherwise inconvenient, just ignore it and hit the closer ones. You won’t run out. To search a digsite, use the Survey ability. The survey tool will spawn and point in the approximate direction of the artifact. Red means you’re far away. Yellow means you’re close. Green means you may be within 40 yards or so. When you discover your find, you’ll get fragments specific to a particular race. There are two main strategies to surveying. You can attempt to triangulate by moving around the outer edge of a digsite. (Like quest blobs, the digsites are not necessarily circular.) Other players just keep surveying, heading in the direction the tool points until they strike paydirt. Remember, the thing you uncover is yours. There is no competition with other players and nobody can gank your node. Whenever you get a new fragment for a race, you’ll start a research project. You can only work on one artifact per race at a time. When you have enough fragments, click Solve to complete that artifact. You won’t waste excess fragments — they will just start the next project. You can be working on one project for each race at a time. 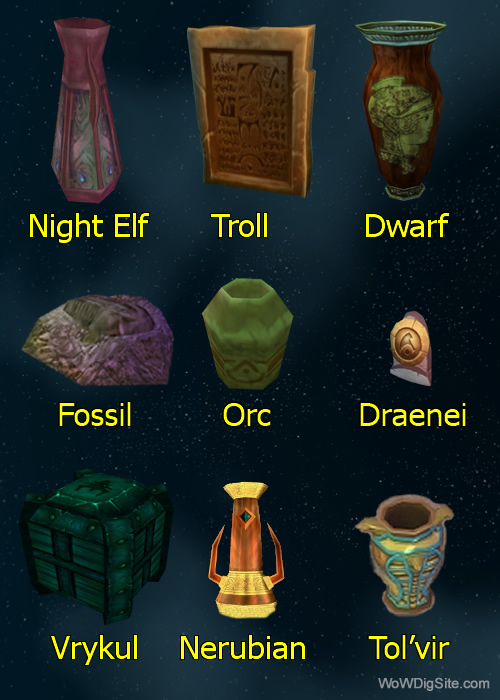 Most artifacts are common. These give you a little bit of lore or flavor text and an item you can sell for a small profit (presumably to a museum!) The profit increases as the value of the artifact increases. You can estimate this by the number of fragments needed to finish the artifact. You will only find cheaper artifacts at low level, but you can find cheap and valuable artifacts at higher level (the reason for this is we want players to be able to find all the artifacts if they want to). You won’t find a second copy of a common object until you have found all the artifacts of that race. If you get stuck at a certain skill level of archaeology or character level, you may find an artifact more than once until you reach the next tier. Some artifacts are rare. These always make a blue or purple item. Many of these have no in-game power and are toys or for flavor. Some of them are actual weapons and armor. The latter items are all bound to account. They aren’t heirlooms in that they don’t scale, but you can pass them around. So if you are level 80 and you find a level 60 axe, you can always have another character use it when they are level 60. You will never get a rare artifact more than once. We designed archaeology to be easily expandable, so we plan to add much more content in future patches, including new races to research (though to be fair, there’s a sizable amount of content already). We also have a feature that is not available on beta yet, that allows you to use your archaeology skill for a slight (think Fish Feast-level) bonus in the Cataclysm dungeons. Find every rare artifact. Yes every one. Stop whining. Recover the Seven Scepters: The Scepter of the Atal’ai, the Scepter of Nezar’Aret, etc. Discover the names of the Five Lost Dwarven Thanes: The Winged Helm of Than Arknel, etc. Website is up! Adding information over the next couple of days!